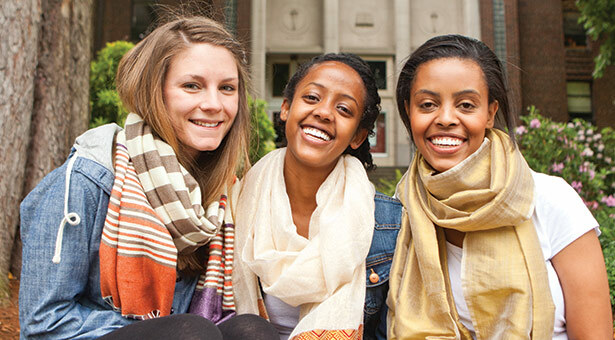 Team Tesfa Netela (from left): Skylar Piro, Sefanit Ghezahegn, and Rediet Mulugeta, show off traditional Ethiopian scarves. When they planned a nonprofit organization to help end obstetric fistula in Ethiopia, Skylar Piro, Sefanit Ghezahegn, and Rediet Mulugeta were told by one expert that they were “too hopeful.” His comment lit a fire beneath them. For Piro, Ghezahegn, and Mulugeta, SPU's mission to engage the culture and change the world is not an abstract idea. Their business plan to empower women in Ethiopia was a natural outgrowth of their education — and a desire to use their knowledge and skill to improve the world's health. Obstetric fistula affects millions of women worldwide, 100,000 of them in Ethiopia alone. The easily preventable and treatable condition results in severe internal injuries, and often abandonment by family and shunning by the community. Access to doctors trained to intervene in difficult labors almost always avoids the complication. But Ethiopia has only 59 OB/GYNs and 1,000 midwives for a population of more than 80 million. Last spring, the three students participated in the Social Venture Plan Competition, sponsored by the Center for Applied Learning in SPU's School of Business and Economics. They formed Tesfa Netela — which means “Hope Scarf” in Amharic — as a holistic approach to the problem. “Tesfa Netela is a grassroots effort to address the needs of women and families who experience the shame and hopelessness of being ostracized,” says Mulugeta, who majored in global development and served on a SPRINT (Seattle Pacific Reachout International) team to Rwanda in 2010. The Tesfa Netela team consulted an advisor who works with Children's Hospital and others knowledgeable in global health issues, textiles, and business. They developed a holistic approach to address not just the physical and mental needs of the women post-fistula surgery, but also provide them with basic health education, literacy, and business skills. They estimated the project would require $30,000 to establish. The plan won an honorable mention in the spring Social Venture Plan competition sponsored by the School of Business and Economics. Twenty-one teams presented plans involving more than 80 students from six regional colleges and universities. Piro plans on grad school in the next year to study mediated conflict resolution. Ghezahegn, who is finishing her degree in global development studies, aims to study women's and community health care practices through a Fulbright grant to do research in Ethiopia. Mulugeta, now an intern with Mission Year in Houston, is living in an urban intentional community learning the ins and outs of nonprofits focused on community development.